Kennedy, Dorothy and Randy Bouchard. "Northern Coast Salish". The Canadian Encyclopedia, 16 October 2018, Historica Canada. https://www.thecanadianencyclopedia.ca/en/article/salish-northern-georgia-strait-coast. Accessed 21 April 2019. 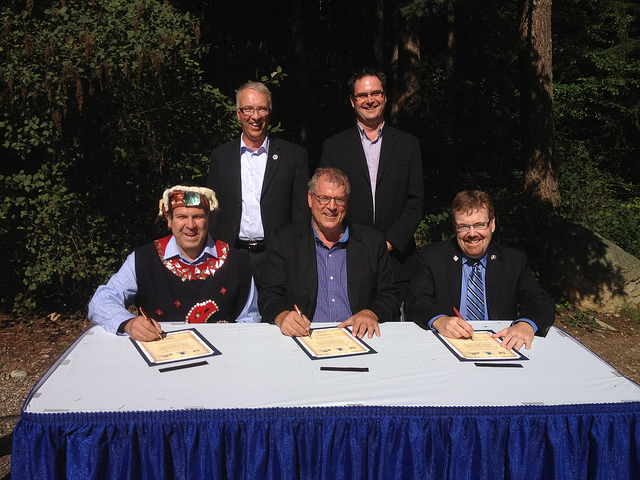 Representatives of the K'omoks (Comox) First Nation, British Columbia government and city of Comox sign a certificate commemorating the expansion of Northeast Woods. The Pentlatch traditionally occupied the central east coast of Vancouver Island, from the vicinity of Cape Lazo to the approximate area of Parksville in the south. They also included the islands of Denman and Hornby. The K’ómoks First Nation describes their territory as stretching from “the eastern portion of Vancouver Island from the Salmon River watershed in the north to the Englishman River watershed in the south.” A large nation, the K’ómoks are often divided into the Island K’ómoks (sometimes simply referred to as the K’ómoks First Nation) and the Mainland K’ómoks, consisting of the Homalco, Klahoose and Tla’amin (Sliammon) First Nations. As their names suggest, the Island K’ómoks live on Vancouver Island, whereas the Mainland K’ómoks live on the British Columbia mainland. Shíshálh (Sechelt) traditional territory is found on the mainland, in and around the various inlets that drain into the Agamemnon Channel. It also includes the southern portion of Texada Island in the Strait of Georgia. Like other Northwest Coast Indigenous peoples, the Northern Coast Salish peoples had access to a wealth of natural resources, including species of Pacific salmon, rockfish, seals, shellfish, deer, mountain goats, bear and migratory birds. Vegetable foods provided a complement to fish and meat. Many Northern Coast Salish peoples constructed houses with gabled rooves. This means that the roof was formed by two sloping sides, making a triangular shape. (See also Architectural History: Indigenous Peoples.) For Coast Salish peoples in general, cedar wood was significant to the construction of homes as well as ropes, mats, basketry, clothing and ceremonial regalia. The social organization of the Northern Coast Salish peoples underwent much change throughout the 1800s, a period characterized by Indigenous warfare and the arrival of white settlers. The Shíshálh peoples were increasingly displaced and forced onto reserves as Europeans settled on their traditional homeland. Diseases transmitted by the Europeans (especially smallpox) also decreased the Shíshálh population. In the early 19th century, the Pentlatch similarly suffered population loss from foreign diseases. They also struggled to protect their people and territory from Indigenous raiding parties from the north and west coast of Vancouver Island. Over time, the Pentlatch joined their K’ómoks neighbours in the north to form one group. The K’ómoks themselves underwent much social and cultural change during this tumultuous period. Starting in the mid-1700s, some Island K’ómoks peoples were displaced by their northern neighbours, the Lekwiltok (Kwakwaka’wakw peoples), who expanded southward. Through intermarriage, the Island K’ómoks adopted the cultural ceremonies and the language (called Kwak’wala) of the Lekwiltok. The Island K’ómoks traditions that have survived this cultural amalgamation remain a source of distinct cultural pride. For the Mainland K’ómoks, peoples living along the eastern shore of the northern Strait of Georgia, the 19th century brought social change. Formerly, the Homalco and Klahoose occupied the protected waters of Bute and Toba inlets respectively, as well as the adjacent islands. By the late 1800s, with European settlement in the area, the main village of the Homalco was located at Church House, near the entrance to Bute Inlet, which they have now abandoned. Squirrel Cove on Cortes Island was (and remains) the home of the Klahoose. The potlatch was (and still is) a cultural ceremony significant to not only the Northern Coast Salish peoples but other Indigenous peoples of the Northwest Coast. During the potlatch, property and gifts are distributed to guests. The carving of house planks and other cedar wood objects also continues to be significant to Northern Coast Salish cultures. 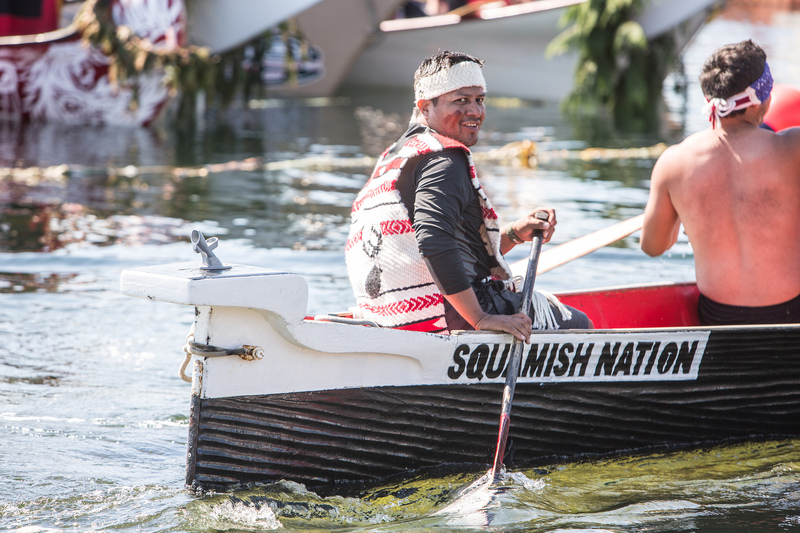 While certain practices were shared by various Salish peoples, such as elaborate naming ceremonies and mask dances, each nation had their own traditions and customs. 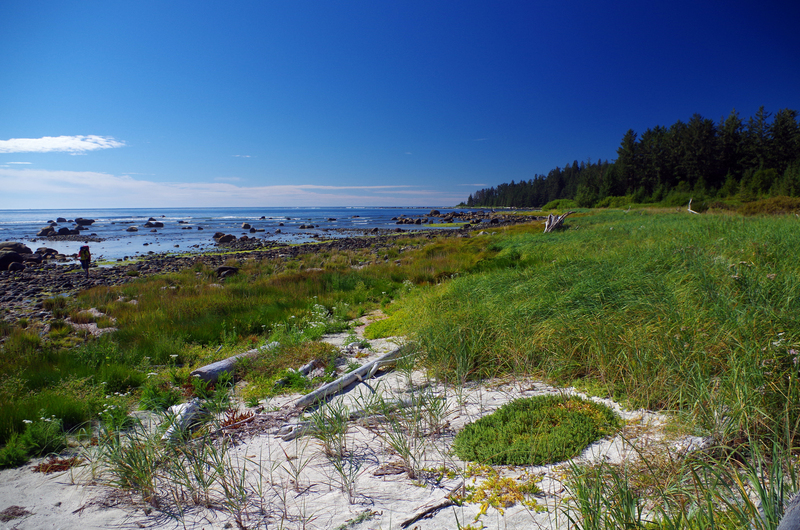 The oral histories of Northern Coast Salish peoples tell about their history and spiritual beliefs. Many speak of a great Spirit who created the world and of ancestors who first populated the traditional territories. Some Coast Salish stories also tell about Transformer beings, such as Raven, who have the ability to shape-shift and bring order to the human world. The Northern Coast Salish peoples encountered European fur traders and explorers, such as Captain James Cook and George Vancouver, in the 1700s and 1800s. During the mid-19th century, Christian missionaries and settlers arrived on the traditional territory of these Salish peoples. Diseases brought over from Europe significantly decreased Indigenous populations, which were also increasingly forced onto reserves. Federal programs and policies aimed at assimilation, such as residential schools and the Indian Act, eroded Indigenous culture and languages. Like other Indigenous peoples in Canada, the Northern Coast Salish peoples strive to protect and promote the traditions and customs that remain. The Shíshálh and Tla’amin peoples are self-governing as of 1986 and 2016, respectively. The K’ómoks began the modern treaty process in British Columbia in 1992, similarly seeking self-government. They are currently in stage five of a six-stage process. Homalco and Klahoose First Nations are both in stage four of the same process, negotiating agreements-in-principle with the federal and provincial governments. Northern Coast Salish peoples are involved in commercial fishing and salmon enhancement programs. Forestry and shellfish harvesting, as well as tourism, also provide employment. The K’ómoks First Nation operates a successful art gallery, I-Hos, specializing in Pacific Northwest Coast Indigenous art. Elise Paul, Written as I Remember It: Teachings (¿¿ms ta¿aw) from the Life of a Sliammon Elder (2014). L. Peterson, The History of the Sechelt Nation (1990). H. Barnett, The Coast Salish of British Columbia (1975); Dorothy Kennedy and Randy Bouchard, Sliammon Life, Sliammon Lands (1983); L. Peterson, The History of the Sechelt Nation (1990). Dorothy Kennedy and Randy Bouchard, Sliammon Life, Sliammon Lands (1983). COMOX Apprenez-en davantage sur la Première Nation Comox et ses territoires traditionnels sur l’île de Vancouver, qu’ils surnomment « terre d’abondance ». TLA’AMIN The Tla’amin Nation (formerly known as the Sliammon First Nation) is located on British Columbia’s Sunshine Coast, just north of Powell River. Read more about it here. HOMALCOS La Première Nation Homalco occupe le bras de mer Bute, près de la côte Sunshine de la Colombie-Britannique. En savoir plus ici. HOMALCO The Homalco First Nation is located in Bute Inlet near the upper Sunshine Coast of British Columbia. Learn more about it here. TLA’AMIN La Nation Tla’amin (autrefois désignée sous le nom de Première Nation Sliammon) est établie sur la côte Sunshine de la Colombie-Britannique, au nord de la rivière Powell. Pour en savoir plus, cliquez ici.